1. 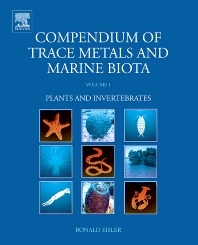 Determine baseline concentrations of metals and metalloids in tissues of representative field populations of estuarine coastal, and open ocean organisms (Book 1:algae and macrophytes, protists, sponges, coelenterates, molluscs, crustaceans, insects, chaetognaths, annelids, echinoderms, and tunicates) (Book 2: elasmobranchs, fishes, reptiles, birds, mammals) and their significance to organism health and to the health of their consumers. 2. Synthesize existing information on biological, chemical, and physical factors known to modify uptake, retention, and translocation of each element under field and laboratory conditions. Recognition of the importance of these modifiers and their accompanying interactions is essential to the understanding of metals kinetics in marine systems and to the interpretation of baseline residue data. Allows the interpretation of baseline residue data.